from New Jersey & You - Perfect Together! 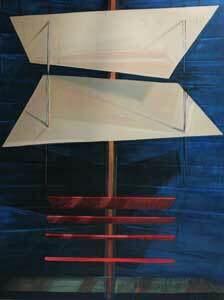 Linda Streicher has participated in three group shows at Village West Gallery: New Jersey & You - Perfect Together! in fall 2017, Under the Influence show in Fall 2016 and the Pro Arts Curators Choice show in Spring 2016. 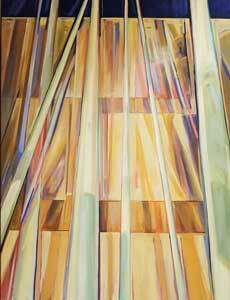 Linda Streicher is an oil painter who brings a distinct architectural voice to her works in which she creates abstract and surreal spaces. Upon receiving undergraduate degrees from the University of Pennsylvania in business and fine arts, Linda worked for Sotheby's while painting at the Art Students League in the evenings. She received her Masters in Architecture from the University of Pennsylvania and worked in architecture in Philadelphia while painting at Fleisher Memorial, and later in San Francisco while painting at CCSF Fort Mason. Currently, Linda paints out of her studio in Morristown, NJ and shows her work throughout the metropolitan area. She co-curates art exhibits for the Hyatt at Headquarters Plaza and conducts workshops at ArtSpace in Morristown. "The process of painting for me begins with a query. I then transpose and respond to the query visually by generating a basic structure or minimal composition composed of lines and planes. Through layers and layers of paint and graphite I traverse throughout the structure. I explore how the lines, planes and subjects interact and change over time as they tilt, move, cast shadows and reflect light. 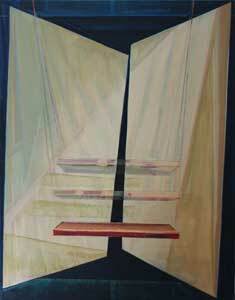 My quest rarely answers the query, but with each painting I gain greater insight." For more information, please visit lstreicher.com.